My dad was fifty-two when I was born, which meant his coming of age stories were different than my friends' dads'. They didn't start with the Summer of Love or Vietnam. They started with Pearl Harbor. He was a senior in high school in San Francisco. And when he heard about the attack, he headed to the beach with thousands of his neighbors, to stare in the direction of Hawaii, and wonder if they were next. President Roosevelt's speech to congress asking for a declaration of war against Japan. It's impossible now to confirm that story, or any of his war stories, because my dad died when I was fourteen. As a kid, I tried to listen to him when he talked about the war, but I didn't retain much. I remember every note of the navy songs he taught me. My favorite is the dirty one about the sailor who knocked up a cockney bar-maid. But the stories he told me only come back in bits and pieces. I know he was an officer on a minesweeper in the Pacific. I remember he talked a lot about a ship called the Minivet. I remember something about a boat anchored near him that blew up, and something about an army jeep he and a friend tried to "liberate" to drive across China. And then there was the story about the Samurai Sword. It hung above the fireplace when I was growing up. "I couldn't really relate to it hanging above the fireplace," my mom giggles when I ask her about it. "But I never, when we were married, I never suggested that he take it down. I mean that was sacred to him." Dad and his crew were going up the Yangtze River in china...The Japanese had already surrendered...and yet a Japanese soldier came screaming down a hill at them, with his sword raised...It was probably about honor...They turned the machine gun on the Japanese soldier...Dad killed him ... Obviously he was expecting to die when he came at them. It was not a stealth operation. Dad was the highest ranking officer involved in the incident, and so he got to keep the soldier's sword, and helmet, as souvenirs. Or at least that's what we think we remember. What I definitely remember was shock, when my Dad told me he'd killed the person who owned the sword. He'd said: "That's war Krissy. It was either him or me." And even as a kid, I could tell the sword meant something to him. Now I wanted to see it again for myself. "It's back here somewhere," my brother Paul tells me, leaning over a pile of old boxes. Since my dad died, Paul has been storing the sword and the helmet in the crawl space under his house. "I know I put it in a place where I didn't think my sons could get at it," he says. And then he reaches past an old lamp. "There it is." "I think the guy was a colonel. Or the equivalent of a colonel," my brother says, picking up the helmet." I ask him why, and he points to the star stamped on it. There is a spider living inside the helmet, and what looks like a blood stain on the chin-strap. The sea-ray skin on the sword is crumbling, but the blade is keen. I bring it all home and hang the sword next to my bed. Two of the hardest kinds of stories to verify are sea stories, and war stories. And this one was both. I order my Dad's naval records. No mention of the sword. But they do list the name of the boat he was on--the YMS 271--and the names of its commanding officers. The only officer I can find is Ralph Patsfall, of Cincinatti. I call him up. The minesweeper only had 32 sailors on board, so I figure the story of the sword must have traveled to Patsfall. I ask him if he remembers my dad. "Well," Ralph pauses. It's a very long pause. "He was a navigator. Tall, dark haired." And that's about all he can say. He does remember playing a lot of bridge. The crew hated eating lamb. And what about the attack by the Japanese soldier when the 2-7-1 was up the Yangtze river in china? "The 271 was never in China," he says. I look into it, and he is right. The 271 was in Japan, and Saipan. But never in China. Either the combined memories of my mom, my brother and me are wrong. Or my Dad was. I go to the national archives in Maryland. The records say my dad was on temporary duty before he boarded the 271. Maybe that's when he was in China? I find other boats he might have been on. I track down crew members. They are either dead, or don't recognize his name. Flag placed at half mast in mourning for the men who died while serving aboard the U.S.S. Minvet. Like my Dad had told me. His signature followed each of the entries in the log-book. My Dad used to take the sword down sometimes, at family functions. He let my cousin use it to cut his wedding cake. But mostly it just hung there, above the fireplace. I would stare at it, imagine my dad pulling it off the body of a dead man. I want to learn more about the sword, so I visit the home of Richard Suran, an expert in Japanese swords. His wife Dorrie tells him to be careful as he inspects my dad's sword from odd angles. "Point it the other way Dear!" she says, as he waves the blade around the kitchen. He sets the sword down, and takes out a giant rubber mallot. 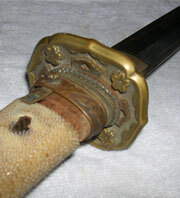 Most of the Japanese swords used during World War Two were army issued, mass produced in the 1930s and 40s. There was only a slim chance my dad's sword was a hand-made antique. But Suran thought it might be. "See that temper line, that pattern on the edge?" he asks as he traces the length of the sword with his finger. I nod. "That was never done by anybody during the world war two days." But in order to know the age of the sword for certain, Suran is looking for a sword-smith's signature. That's what the rubber mallot is for, to dislodge the wooden peg or "mekugi" that holds the handle on to the hilt. After ten minutes of banging on the mekugi, Suran finally breaks it apart, and pries off the fixtures. "Hey! I think it's...Yes. We have a signature," he announces. "The name on there is Nagatsuna"
So the sword was hand-made. Suran consults his books, and estimates it was forged near Osaka, in the 1660s. About three hundred and forty years old. He points to the engraved feathers on the handle: a family crest. A family crest means a previous family owned the sword. "Common sense. Common sense!" Harunaka Hoshino shouts to the two students who are fighting with bamboo swords in his dojo. One of the men thwacks his sword against the other's armored chest. "Good one!" Hoshino says. Hoshino runs his sword school in a tiny store-front in the foggiest part of San Francisco. He helps identify swords, and now and then reunites them with their previous owners in Japan. I show him my sword and he agrees on its age. Judging from the tassles, he thinks the sword belonged to a field officer. "So probably through the generations," Hoshino says, in a thick Japanese accent, "his family owned it. And then he took it to war, for comfort. This not going to protect you, right? The guns and the rifles and the atomic bomb will protect you. So this is a spiritual thing." I ask Hoshino if he can he help me find the previous owners family. "Ah... kind of hard to find. Probably the guy don't want any more." He points at the sword. "This is war time," he says. "Scary." He looks at the sword again. "You should fix it up. Maybe it can become your family heirloom." Ted Eversten is a retired policeman from Pheonix, and his dad also brought home a Japanese sword during World War II. A few years ago, Eversten tracked down the son of the man who'd owned it. There was a silk tag on the sword with the original owner's name on it. Takashi Uchimi is that man's son. Uchimi is seventy now. He'd barely known his father, who'd died of typhoid fever during the war when Uchimi was just a boy. Eversten recently contacted Uchimi to tell him he wanted to return his father's sword, and he got a letter back. Thank you for your letter. I am very pleased to know that the sword was treated well somewhere in the world. I feel bad to receive the sword that your father had treasured. But it would be my great honor to receive it from you. I get Uchimi and Eversten on the phone together. It's the first time they've ever talked. Uchimi doesn't speak English, so a friend translates for him. "He doesn't have many memories about his father" she explains. "So he feels like it's part of family comes back to the house. Like the sword is like a father, kind of. And so it would be nice to have to hold." It would be nice to have to hold. I think I know what Uchimi means. It feels good to have my dad's samurai sword nearby. Even if I don't know for certain how he got it, or who it belonged to first. The annoying thing that happens when a person dies is that you can't have new conversations with him. Everything stops cold. Trying to learn more about this rusty sword has let me start a new conversation with my dad. Hi Krissy, just finished reading your dad story. I am writing a history of the YMS 271 and my time serving on it from July'44 to May '46. You mentioned the deck log which your dad sign, if you give me a few entries he had signed, it will jog my memoris, as navigation officer, he might have gone to a river in japan to get the mine maps of Tokyo bay before the surrender treaty was signed, he might have got the name wrong. Jack B.
i enjoyed your article and wanted to say that he is My Ninjutsu Master of the Fuma Ryu in Great Britain.